I saw on the Kraftin' Kimmie Blog that they are having a Guest Designer Contest, so I thought I would throw my hat in the ring. 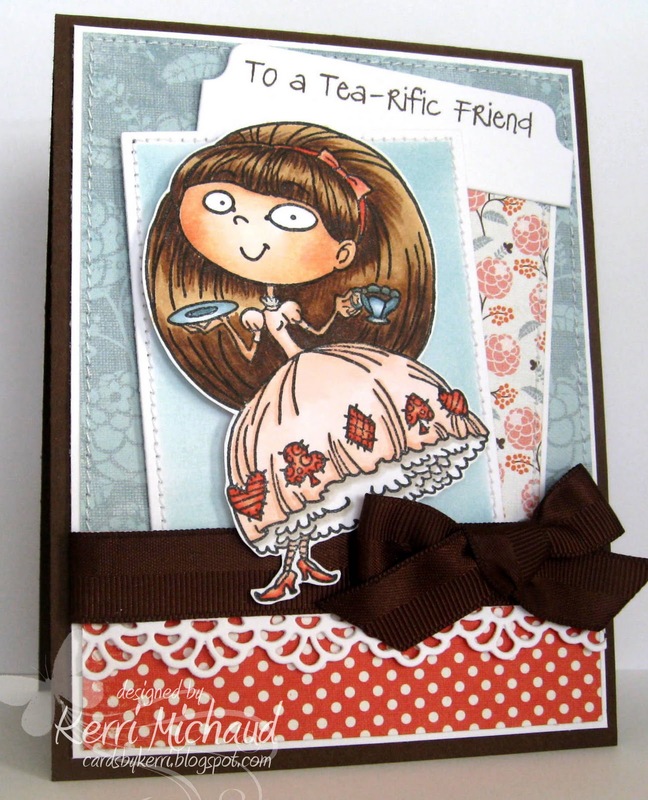 I just adore these cute and quirky images! The challenge is to use your favorite Kraftin' Kimmie stamp so I pulled out this darling gal~Gabrielle! Isn't she the sweetest?! I used some beautiful paper from My Mind's Eye Honey Cake and the layout is Sketchbook Saturday Challenge #35. I will leave a complete recipe below. Well my family just walked in with some pizza! We're having quite the lazy day because we're still trying to recoup after last night LOL! Thank you so much for stopping by and have a wonderful rest of your Sunday! Kerri, what a cute card! Love this image so much!! Congrats on making the team girl. Your work is beautiful!!! Yay!!! Congrats Kerri!!! You totally deserve this, you talented girl!